Niger, officially the Republic of Niger, is a landlocked sub-Saharan country in western Africa, named after the Niger River. Though rich in minerals, the country is two-thirds desert and prone to droughts. Inadequate nutrition and disease result in high infant and child mortality rates. The extreme poverty also allows slavery to persist, despite being prohibited in the 1999 constitution. Niger was an important economic crossroad, and the empires of Songhai, Mali, Gao, Kanem-Bornu, as well as a number of Hausa states, claimed control over portions of the area. During recent centuries, the nomadic Tuareg formed large confederations, pushed southward, and, siding with various Hausa states, clashed with the Fulani Empire of Sokoto, which had gained control of much of the Hausa territory in the late eighteenth century. In the nineteenth century, contact with the West began when the first European explorers explored the area, searching for the source of the Niger River. Although French efforts at pacification began before 1900, dissident ethnic groups, especially the desert Tuareg, were not subdued until 1922, when Niger became a French colony. Gradually, France granted limited local participation in political institutions, then a large measure of self-government. In 1958, Niger became an autonomous state within the French Community, and it reached full independence on August 3, 1960. For its first 14 years as an independent state, Niger was run by a single-party civilian regime under the presidency of Hamani Diori. In 1974, a combination of devastating drought and accusations of rampant corruption resulted in a military coup. Col. Seyni Kountché and a small military group ruled the country until Kountché's death in 1987. He was succeeded by Col. Ali Saibou, who released political prisoners, liberalized some of Niger's laws and policies, and promulgated a new constitution. He gave in to demands by unions and students to institute a multi-party democratic system in 1990, and new political parties and civic associations sprang up. A transition government was installed in 1991. Rivalries within a ruling coalition elected in 1993 led to governmental paralysis, which provided Col. Ibrahim Baré Maïnassara a rationale to overthrow the government in 1996. Baré organized a presidential election in 1996 and was declared the winner. When his efforts to justify his coup and subsequent questionable elections failed to convince donors to restore economic assistance, a desperate Baré sought Libyan funds. His regime repeatedly violated basic civil liberties. In 1999, Baré was killed in a coup led by Maj. Daouda Malam Wanké, who established the transitional National Reconciliation Council to oversee the drafting of a constitution. In votes that international observers found to be generally free and fair, the Nigerien electorate approved the new constitution in July 1999. Legislative and presidential elections were held in October and November 1999. Heading a coalition of the National Movement for a Developing Society (MNSD) and the Democratic and Social Convention (CDS), Mamadou Tandja won the presidency. 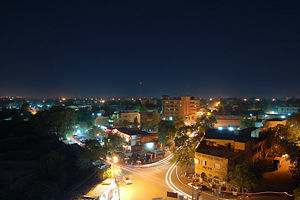 In July 2004, Niger held nationwide municipal elections as part of its decentralization process. The ruling MNSD won more positions than any other political party, but opposition parties made significant gains. In November and December 2004, Niger held presidential and legislative elections. Mamadou Tandja was elected to his second five-year presidential term with 65 percent of the vote in an election that international observers called generally free and fair. This was the first presidential election with a democratically elected incumbent. In the legislative elections, the coalition that backed Tandja won 88 of the 113 seats in the National Assembly. Listed by the United Nations as one of the poorest nations, it qualified for special United States aid because the government had demonstrated a commitment to reform in 2006. Niger's 1999 constitution restored a semi-presidential system of government in which the president, elected by universal suffrage for a five-year term, and a prime minister named by the president share executive power. As a reflection of Niger's increasing population, the unicameral National Assembly was expanded in 2004 to 113 deputies elected for a five-year term under a majority system of representation. Political parties must attain at least 5 percent of the vote to gain a seat in the legislature. The constitution also provides for the popular election of municipal and local officials. 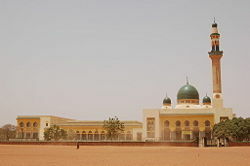 Niger's independent judicial system is composed of four higher courts—the Court of Appeals, the Supreme Court, the High Court of Justice, and the Constitutional Court. The country is currently divided into eight regions, which are subdivided into 36 districts (departments) and further subdivided into 129 communes. The chief administrator (governor) in each department is appointed and functions as the agent of the central authorities. 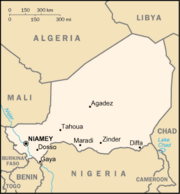 Niger is a landlocked nation in West Africa located along the border between the Sahara and sub-Saharan regions. It borders Nigeria and Benin to the south, Burkina Faso and Mali to the west, Algeria and Libya to the north, and Chad to the east. Niger is slightly less than twice the size of the U.S. state of Texas, and the world's 22nd largest country (after Chad). Niger's subtropical climate is mainly very hot and dry, with much desert area. In the extreme south, the climate is tropical on the edges of the Niger River basin. The terrain is predominantly desert plains and sand dunes, with flat to rolling savannah in the south and hills in the north. Niger is one of the poorest countries in the world, ranking last on the United Nations Development Programme's Human Development Index. Its economy centers on subsistence crops, livestock, and some of the world's largest uranium deposits. Drought cycles, desertification, a 2.9 percent population growth rate, and a drop in world demand for uranium have undercut the economy. Niger shares a common currency, the CFA franc, and a common central bank, the Central Bank of West African States (BCEAO), with other members of the West African Monetary Union. The government embarked on an ambitious program to privatize 12 state-owned companies and is taking actions to reduce corruption. As the result of a participatory process encompassing civil society, Niger has devised a Poverty Reduction Strategy Plan that focuses on improving health, primary education, rural infrastructure, agricultural production, environmental protection, and judicial reform. In 2000, Niger qualified for enhanced debt relief, which significantly reduces Niger's annual debt service obligations, freeing funds for expenditures on basic health care, primary education, HIV/AIDS prevention, rural infrastructure, and other programs geared at poverty reduction. Nearly half the government's budget is derived from foreign donor resources. In 2006, it qualified for the U.S. aid program under the Millennium Challenge Corporation, which will support efforts to fight corruption and increase girls' access to primary education. Ties with China have also grown. Future growth may be sustained by exploitation of oil, gold, coal, and other mineral resources. Uranium prices have recovered somewhat in the last few years. Slavery has existed since pre-colonial times. The French tried to eliminate the slave markets, but the system persisted, even after being banned in the 1999 constitution. Primarily the slaves herd cattle or do agricultural or domestic work. They are not permitted to vote, and their children are born into slavery. An estimated 43,000 people were slaves in 2003, when the government added stronger sentences to the penal code, hoping to end the practice. The fertile south of Niger near the river delta. Niger's agricultural and livestock sectors are the mainstay of 82 percent of the population. Fourteen percent of Niger's Gross Domestic Product (GDP) is generated by livestock production—camels, goats, sheep, and cattle—said to support 29 percent of the population. The 15 percent of Niger's land that is arable is found mainly along its southern borders with Nigeria, Benin, and Burkina Faso. Rainfall varies and, when insufficient, Niger has difficulty feeding its population and must rely on grain purchases and food aid to meet food requirements. Of Niger's exports, foreign exchange earnings from livestock are second only to those from uranium. Niger's two uranium mines are owned by a French-led consortium and operated by French interests. When the uranium-led boom ended in the early 1980s, the economy stagnated, and new investment since then has been limited. Exploitable deposits of gold are known to exist in the region between the Niger River and the border with Burkina Faso. Commercial gold production began in 2004. Substantial deposits of phosphates, coal, iron, limestone, and gypsum also have been found. Oil exploration is ongoing. In recent years, the government drafted revisions to the investment, petroleum, and mining codes, offering attractive terms for investors. The present government actively seeks foreign private investment, considering it key to restoring economic growth and development. Niger pursues a moderate foreign policy and maintains friendly relations with the West and the Islamic world as well as nonaligned countries. It belongs to the United Nations and its main specialized agencies. Niger maintains a special relationship with France and enjoys close relations with its West African neighbors. The border dispute with Benin, inherited from colonial times, was finally solved in 2005 to Niger's advantage. The largest ethnic groups in Niger are the Hausa, who also constitute the major ethnic group in northern Nigeria, and the Djerma-Songhai, who also are found in parts of Mali. Both groups, along with the Gourmantche, are sedentary farmers who live in the arable, southern tier of the country. The remainder of Nigeriens are nomadic or semi-nomadic livestock-raising peoples. With rapidly growing populations and the consequent competition for meager natural resources, lifestyles of agriculturalists and livestock herders have come increasingly into conflict. Life expectancy is 46 years. Niger's high infant mortality rate is comparable to levels recorded in neighboring countries. The child mortality rate (deaths among children between the ages of one and four) is exceptionally high due to generally poor health conditions and inadequate nutrition for most of the country's children. Niger has the highest fertility rate in the world, which means that nearly half (49 percent) of the population is under age fifteen. Between 1996 and 2003, primary school attendance was around 30 percent, including 36 percent of males and only 25 percent of females. Additional education occurs through madrassas. French is the official language. The overall literacy rate is 15 percent. Muslims make up 95 percent of the population. The remainder is traditional and Christian. Niger started to develop diverse media in the late 1990s. Niamey boasts scores of newspapers and magazines, many of which are fiercely critical of the government. Radio is the most important medium, as television sets are beyond the buying power of many of the rural poor and illiteracy prevents the print media from becoming a mass medium. In addition to the state broadcaster, there are four privately owned radio networks, which total more than a hundred stations and are estimated to cover about 70 percent of the population. Despite relative freedom at the national level, Nigerien journalists say they are often pressured by local authorities. The state network depends financially on the government. ↑ Merriam-Webster Dictionary Retrieved November 19, 2011. ↑ Oxford Dictionaries Retrieved November 19, 2011. ↑ Central Intelligence Agency (2009). Niger. The World Factbook. Retrieved November 19, 2011. ↑ 4.0 4.1 4.2 4.3 Niger. International Monetary Fund. Retrieved 21 April 2011. ↑ UNICEF, At a Glance: Niger Statistics. Retrieved June 19, 2007. Anti-Slavery International. Slavery in Niger. Retrieved June 19, 2007. Central Intelligence Agency. Niger. The World Factbook. Retrieved June 19, 2007. UNICEF, At a Glance: Niger. Retrieved June 19, 2007. U.S. Department of State. Background Note: Niger. Retrieved June 19, 2007. All links retrieved December 3, 2018. Niger Assemblee Nationale official site (in French). Mission of Niger to the United Nations official site (in French). 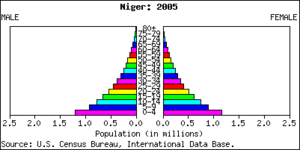 This page was last modified on 4 December 2018, at 00:10.